It’s been a long wait since Dimples first posted on the new 2D animated series from Nickelodeon, The Mighty B, but it is finally time for the premier episode this Saturday, April 26, at 10:30 AM. This looks like a great series with a great lead character in Bessie Higgenbottom, great voice actors and excellent animation. Take a look at some clips from The Mighty B. First is a rough animation of a scene and the second is a promo for the series. “Mighty B,” picked up for 20 episodes, stars Amy Poehler as the voice of Bessie Higgenbottom, the world’s most ambitious and lovably unhinged 10-year-old “Honeybee” scout. As a member of the Honeybees, Bessie wears her uniform every single day, leads her troop with a zeal General Patton would have admired and has earned more Bee Badges than any Honeybee in history. But a bunch of badges still elude her, and Bessie’s not stopping until she has every last one. 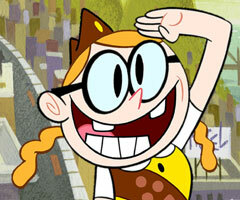 Poehler co-created the cartoon with “The Fairly OddParents” staff writer Cynthia True and the Emmy- and Annie-nominated storyboard artist and writer Erik Wiese. Darling Dimples theme is a modified version of Brian Gardner's Revolution.